Dr. Christopher Day is an affiliate researcher with the Center for Transportation Research and Education. 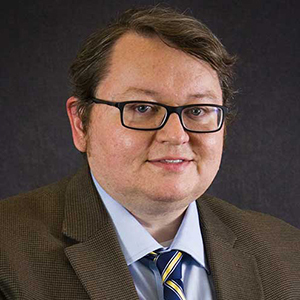 His research focuses mainly on performance measures for highway transportation systems, particularly in their integration with transportation agency business practices. This research was supported in part by funding from National Academies projects, including NCHRP 3-122. The products of that research have seen widespread implementation in practice. Dr. Day’s work on automated traffic signal performance measures has been selected as a focus technology by the Federal Highway Administration’s Every Day Counts program and has been adopted by most traffic control equipment vendors in the US. Dr. Christopher Day received bachelor’s and master’s degrees in physics at Ball State University in 2004 and 2006, and master’s degree and PhD in civil engineering from Purdue in 2007 and 2010. He is currently an assistant professor in Civil, Construction, and Environmental Engineering at Iowa State University. Before joining ISU, Dr. Day worked for about seven years as a senior research scientist in the Joint Transportation Research Program at Purdue University. His research has focused mainly on performance measures for highway transportation systems, particularly in their integration with transportation agency business practices. This research was supported in part by funding from National Academies projects, including NCHRP 3-122. The products of that research have seen widespread implementation in practice. Dr. Day’s work on automated traffic signal performance measures has been selected as a focus technology by the Federal Highway Administration’s Every Day Counts program and has been adopted by most traffic control equipment vendors in the US. Prof. Day is a member of the TRB Standing Committee on Traffic Signal Systems (AHB25) and is a member of ITE, ASCE, and IEEE. He is a licensed professional engineer in the state of Indiana. Day, C. M., H. Li, L. Richardson, J. Howard, T. Platte, and D. M. Bullock. 2017. Detector-free optimization of traffic signal offset with connected vehicle data. Transportation Research Record: Journal of the Transportation Research Board, No. 2620, pp. 54–68. Day, C. M. and D. M. Bullock. 2017. Investigation of self-organizing traffic signal control with graphical signal performance measures. Transportation Research Record: Journal of the Transportation Research Board, No. 2620, pp. 69–82. Li, H., L. M. Richardson, C. M. Day, J. Howard, and D. M. Bullock. 2017. Scalable split failure identification dashboard and split time improvement heuristic. Transportation Research Record: Journal of the Transportation Research Board, No. 2620, pp. 83–95. Richardson, L. M., M. D. Luker, C. M. Day, M. Taylor, and D. M. Bullock. 2017. Outcome assessment of peer-to-peer adaptive control adjacent to a national park. Transportation Research Record: Journal of the Transportation Research Board, No. 2620, pp. 43–53. Young, S. E., E. Sharifi, C. M. Day, and D. M. Bullock. 2017. Visualizations of Travel Time Performance based on Vehicle Re-Identification Data. Transportation Research Record: Journal of the Transportation Research Board, No. 2646, pp. 84–92. Day, C. M. and D. M. Bullock. 2016. Cycle length strategies for a diverging diamond interchange in a signalized arterial. Journal of Transportation Engineering, Vol. 142. Day, C. M. and D. M. Bullock. 2016. Opportunities for detector-free signal optimization with limited connected vehicle market penetration: a proof-of-concept study. Transportation Research Record: Journal of the Transportation Research Board, No. 2558, pp. 54–65. Lavrenz, S. M., C. M. Day, J. Grossman, R. Freije, and D. M. Bullock. 2016. Use of high-resolution signal controller data to identify red light running. Transportation Research Record: Journal of the Transportation Research Board, No. 2558, pp. 41–53. Day, C. M. and D. M. Bullock. 2014. Design guidelines and conditions that warrant deploying fully actuated coordination. Transportation Research Record: Journal of the Transportation Research Board, No. 2439, pp. 1–11. Day, C. M., J. R. Sturdevant, H. Li, A. M. Hainen, S. M. Remias, and D. M. Bullock. 2013. Revisiting the cycle length—lost time question with critical lane analysis. Transportation Research Record: Journal of the Transportation Research Board, No. 2355, pp. 1–9. Brennan, T. M., C. M. Day, J. R. Sturdevant, and D. M. Bullock. 2011. Visual education tools to illustrate coordinated system operation. Transportation Research Record: Journal of the Transportation Research Board, No. 2259, pp. 59–72.